I was reminded the other day during a conversation with a friend that today June 11th is my wedding anniversary. In the moment I thought it was odd that I had completely forgotten and that I honestly felt nothing. I remember thinking I would just let the day pass without any acknowledgement whatsoever. However, during my shower the other morning I caught an image that this year I could create a new story around this significant anniversary just like I did with Valentine’s Day in my February 2017 post. If you missed that entry I invite you to check it out if you feel it may be helpful. If Claude were still here in physical form we would be celebrating our 22nd year of marriage. While there is still sadness that he is not here with me, I saw that this time around I could choose to see this as an opportunity to celebrate all the years he has been a part of my life, all the years I have loved him. I acknowledged he is with me every day. He still lives in my heart and in my thoughts, that will never change. So why not celebrate that? Our love has been an incredible gift in my life dead or alive. He lives on in our son the most magnificent gift of all. Even in his death the gifts continue. Yes, it’s true that his suicide has been the most horrific, heart wrenching and painful experiences of my life. Yet these past five years since his death together with the pain and suffering I have grown in innumerable ways and my life has become more authentic and purposeful. In short these past five years have been filled with my deepest sorrows yet also filled with my greatest gifts. All day my heart has felt imbued with the warmth of love. I have been holding and honoring the memories of that special day. I can even hear the waves crashing on the shore as if I were re-living the moment. I have taken an excerpt from the blog post I shared June 2016 encapsulating a snapshot of our wedding day. I am remembering with such sweetness, my wedding day with Claude. Yesterday would have been our 21st wedding anniversary. That day was infused with anticipation, stunning clear blues skies on the coast of Northern CA, the sound of the crashing ocean waves below us as we said our wedding vows surrounded by an intimate group of family and friends. It was picture perfect! I had brunch with my son Noah this morning and we talked about how life changes over time in ways we can’t possibly predict from our current vantage point. I told him I could never have imagined this scenario 22 years ago on that “picture perfect” day. That his dad would one day die by suicide and we would be sitting together here in Boulder talking about it. Life marches on with or without our beloved by our side. Of course we must grieve and process our loss yet we must also embrace this life that we are still living as best as we can. We are still here to complete our soul’s desires. I completely understand how devastating and challenging this road through grief can be. Learning to put all the pieces of our hearts and our lives back together one by one takes time and commitment to healing and finding your way through this emotional quagmire. But I am here to say it can be done. 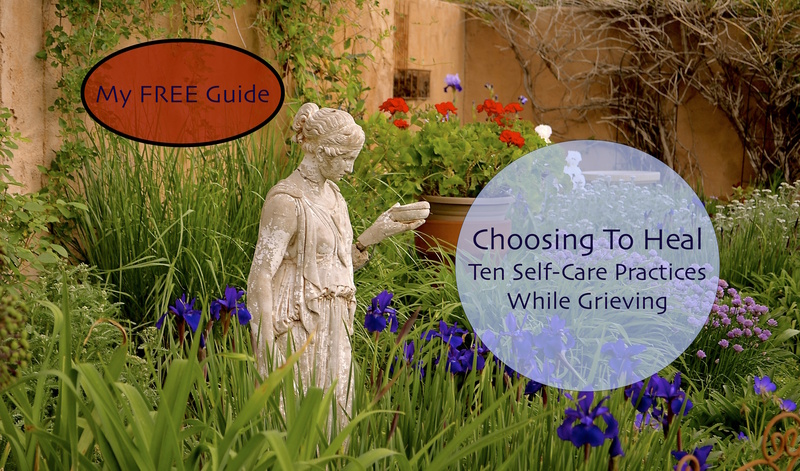 What steps can you take this week to support this unfolding, the commitment to your own healing journey through grief? It seems that the visit back to the place you and Claude spent such meaningful times together has helped you gain a new perspective on events. Congratulations on your bravery and continued commitment to live for the future, while respecting the past. What a beautiful bride, and beautiful couple! I like this idea of celebrating the years together and the even-longer years of love. Congratulation on your celebration. !